We’re more than halfway through the term already! The EGSS would like to thank everyone who came out to the Halloween Social — it was great to see so many new and returning students there. We hope to see many more of you at future events, especially the EGSS Pomodoro Night on Nov. 21! It will be both a productive and fun evening in equal measure. The EGSS is also happy to help promote (through Twitter and this website) any events organized by or involving English graduate students (i.e. not limited to official EGSS events). If you have events or good news to share, tweet to @uvicegss or email uvicegss[at]gmail.com so that they can be included in future newsletters. Posters, images, tips, announcements, CFPs, or links are all welcome! Consider contributing to our student blog! See below (“Student Blog”) for examples or see the “Want to Contribute?” page for more. Congrats to all PhD students who wrote and/or defended their comprehensive exams — and best of luck for those defending soon! Congrats to Danny Martin (1st-year MA), who is now the Director of Communications for the GSS (Graduate Student Society). Congrats to Heidi Rennert (1st-year MA), who is now the co-chair of the EGSS Academic and Professional Committee. Congrats to all students whose proposals were accepted to VSAWC/VISAWUS 2017, the annual conference of the Victorian Studies Association of Western Canada. The EGSS President and Vice-President welcome suggestions, feedback, or concerns about course offerings for the 2017-2018 academic year. Any comments or concerns can be directed, confidentially, to Angie (MA Rep; Vice-President) or Bassam (PhD Rep; President), either in-person or by email. The EGSS team is hard at work planning several events, both professional and social activities, for the rest of the term: a Pomodoro night, a launch party for a creative journal, and a Christmas party! See the minutes for more info. Catriona wrote a post based on her talk for the ETCL’s Nuts and Bolts series. There, she spoke about her work on the Map of Early Modern London. Natalie and Heidi compiled a list of resources for those looking to submit a paper to a conference, or just to get the lay of their scholarly field. Natalie also wrote a post based on her experience presenting at her first conference in Albuquerque, New Mexico. Thanks to all who have contributed to the blog so far! If you would like to contribute, see the “Want to Contribute?” page for more. 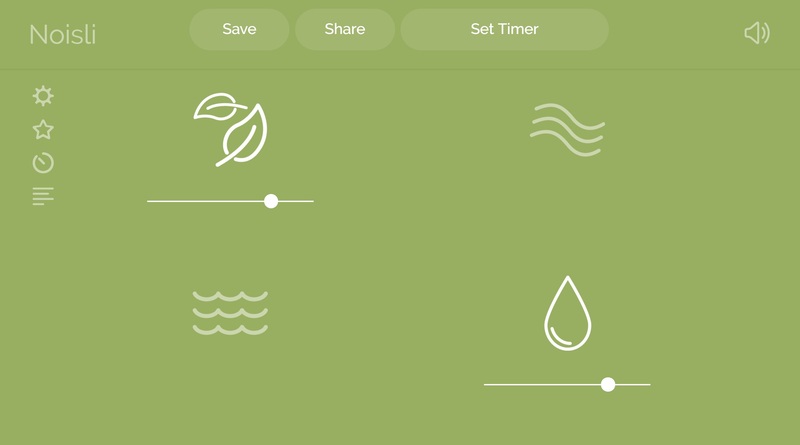 Assignment season is upon us…For those looking for the right background noise environment, consider Noisli, a background noise generator/mixer and productivity tool in your browser. There are also apps for iPhone and Android (with some paid features) and a Google Chrome extension. If you have a suggestion for a tool tip, let us know or consider writing a blog post about it. Weekly on Tuesdays at 10:30am: Pro D Workshops. See CourseSpaces for more and to register. This month, there are sessions on Writing Your Dissertation, Peer Skill Swap, and Social Media. 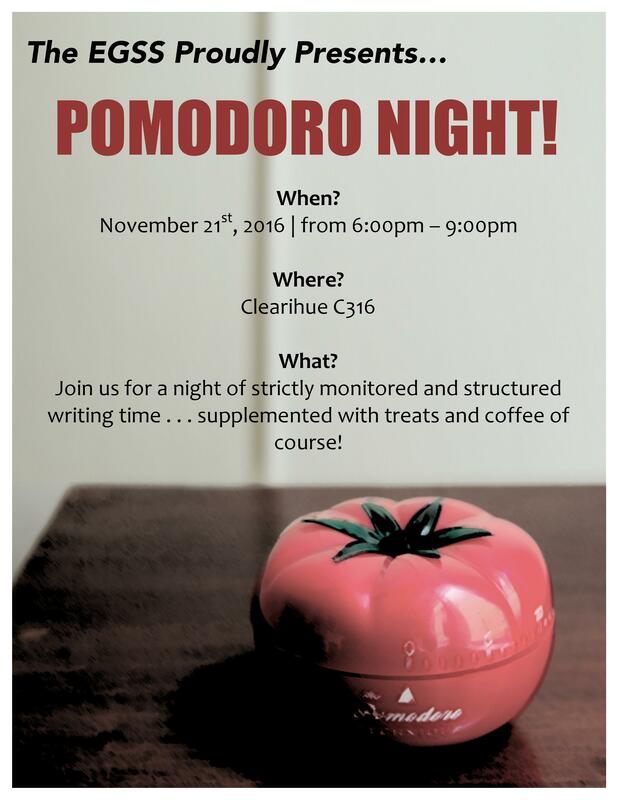 Nov. 21st at 6:00pm: Pomodoro Night. Join us for a few hours of group essay writing (using the pomodoro technique), replete with coffee and treats. All are welcome and free to come and go as they please. Nov. 23rd at 6:00pm: Trivia Night. A group of the English graduate students go to GSS monthly trivia (and wing night) as a fun way to catch up and de-stress. We’ve won two certificates and bragging rights. Come out for a chance at a free pitcher of beer and help us improve our record! Nov. 23rd at 7:30pm: P. K. Page at 100. A tribute to and celebration of Victoria P. K. Page’s life and work, featuring readings and a panel discussion. Organized by The Malahat Review. Nov. 24th at 4:30pm: “Victorian Agnostic Networks,” part of the CSRS Public Lecture Series. Bassam Chiblak, our current EGSS president and CSRS Ian H. Stewart Graduate Student Fellow, will be giving a talk on the influence of agnostic literary networks on the reception of Victorian periodical fiction. Dec. 5-9th: Journal Article Writing Bootcamp. Alison Chapman (Grad Advisor) is holding a weeklong bootcamp for turning a paper into a polished article. Check your email for more info and to state your interest no later than Nov. 18. PhD students have priority.